All models of the Sonerai II use a minimum of different sizes of materials to reduce the cost, without hampering the integrity of the design. The wing is all aluminium and is composed of two panels that easily fold along side the fuselage enabling the Sonerai II, II-L and II-LT to be towed tail first on its own gear. Stainless steel cherry rivets are used to skin the wing. The fuselage and tail surfaces are constructed of standard sizes of 4130 steel tubing that are fabric covered. All aluminium sheet used is 2024-T3 .025" except for the spars which are .040". The fibreglass cowling removes easily to allow complete access to the engine, magneto, tank and instruments. The landing gear is a formed aluminium spring with 5" wheels and 3/4" axles. 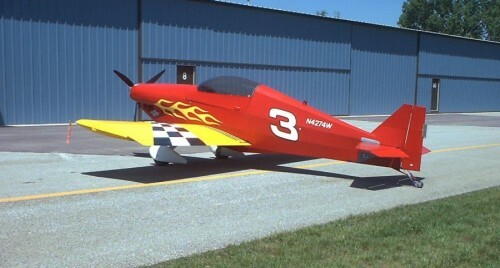 A tapered tailspring rod is used for the tailwheel (II and II-L) All Sonerai II's feature a l0 gallon main tank with the option of a 6 gallon auxiliary tank carried on the passengers floor board (w/out passenger). The Sonerai II, II-L and II-LT are an excellent choice for the individual who desires a high performance, two place VW powered sport aircraft. The Sonerai II series will accept VW powered plants in size from 1700cc - 2180cc.